The Red Feedsack: Is It July Already? I've been working most every evening in my garden and it is producing and beautiful. 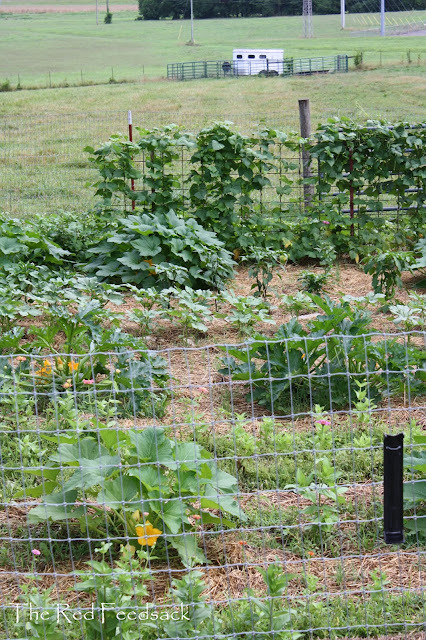 I'm so happy with the Baker Creek heirloom seeds I planted. So far the yield is amazing. My garden is at the bottom of the hill and gets the late afternoon and evening shade, so it sure makes it nice for weeding. I think I bought 4 or 5 varieties of heirloom zinnia seeds that are blooming and I love them. They are one of those flowers that just make me so happy when I look at them. 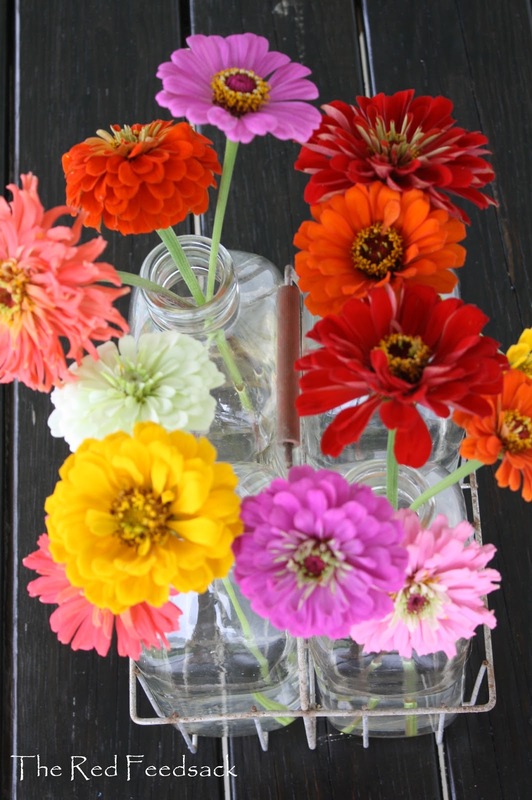 I bought these antique milk bottles last year at Bella Rustica and they are so colorful on the picnic table with the zinnias. I'm surprised at how long they stay pretty too. 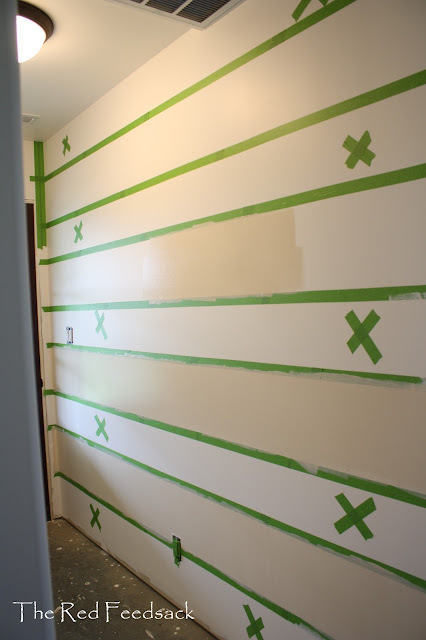 I've been sanding, staining, and varnishing stair treads for Eldon and in between all that I've been working on this wall in the laundry room. Ever since seeing the plaid wall in the Southern Living Idea House last year I've wanted to copy it. Its not quite finished yet, but I'm hoping for the best! I'll be sure to tell you all about it later! I'm not ready to share any more house progress pictures yet, but I will tell you what we've done in the last couple weeks... all the butcher block counter tops are installed and absolutely gorgeous, center island in place (that was a job), farmhouse sink and new Pfister faucet installed, flooring and baseboard trim installed in the living room, stair treads and risers in place, stail rail and balusters installed on that dangerous open wall in the barn room overlooking the kitchen, and Eldon working on the main stair rail and balusters now. I come behind and caulk and paint wherever needed! I'm really, really excited to share my kitchen cabinets and do a full post on that, but we are waiting for the cabinet guys to come back and install all the doors and hardware. Keeping my fingers crossed for next week! 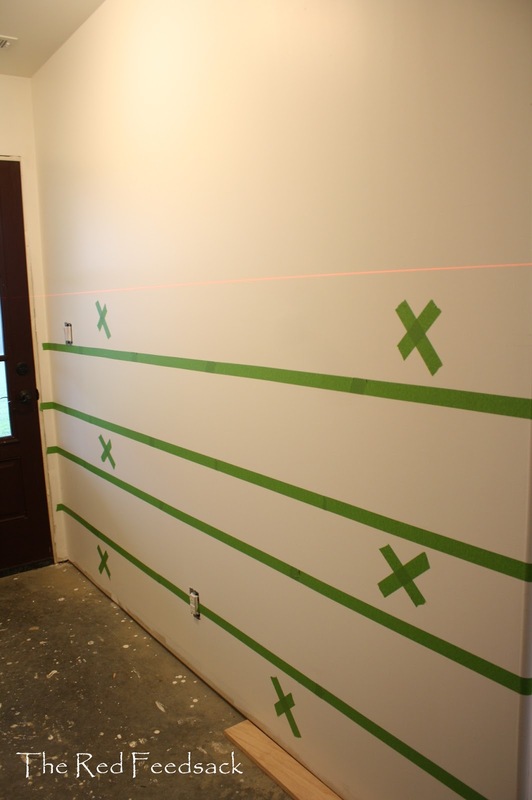 My next house progress post is one of the ones I have in the works! I've also been working on a Monthly Moos post for July and have really enjoyed taking pictures of our farm. 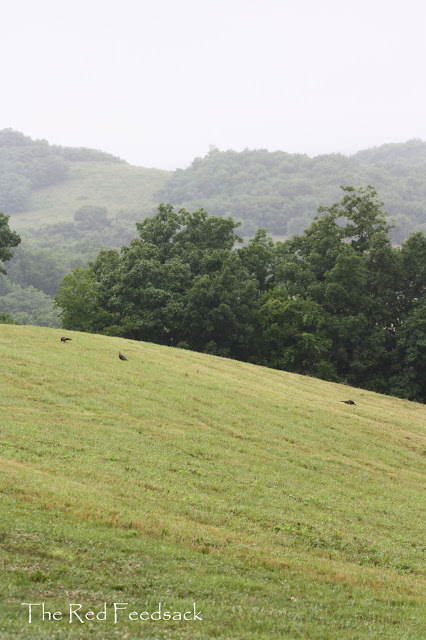 This morning we were having a good steady drizzle and I looked out and saw these wild turkeys enjoying the rain. I love the wild animals on our farm. 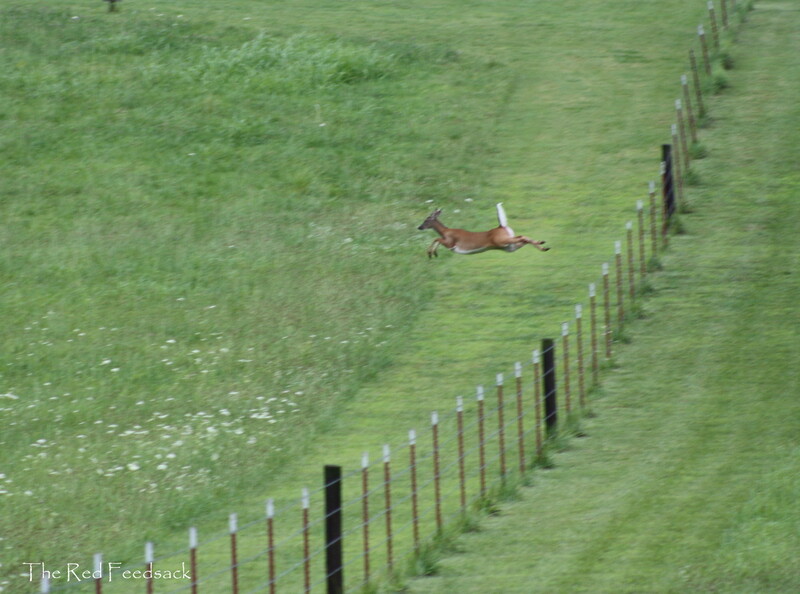 And speaking of the wildlife on our farm. I happened to have my camera around my neck when I came out of the woods to this sight the other day. Isn't she the most beautiful animal? My daughter and I also picked blueberries and I made jam. 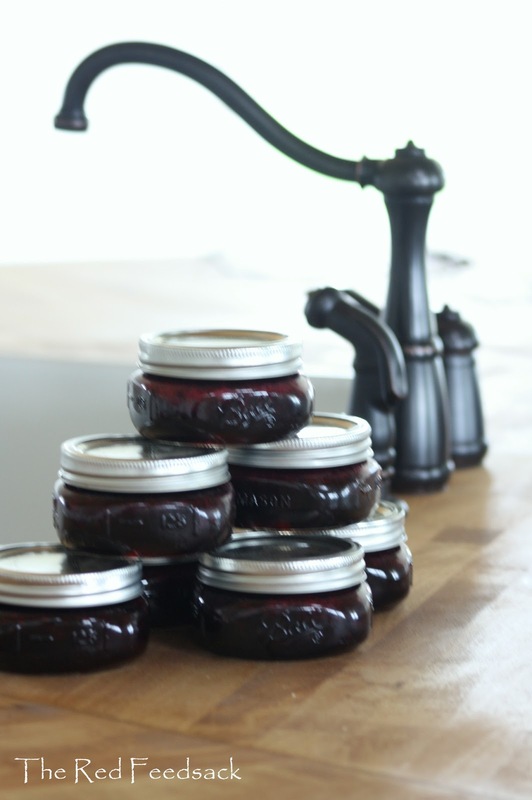 I have tried to stay away from it but I've had a bite of Eldon's jam and biscuit a few times and oh it is so good! 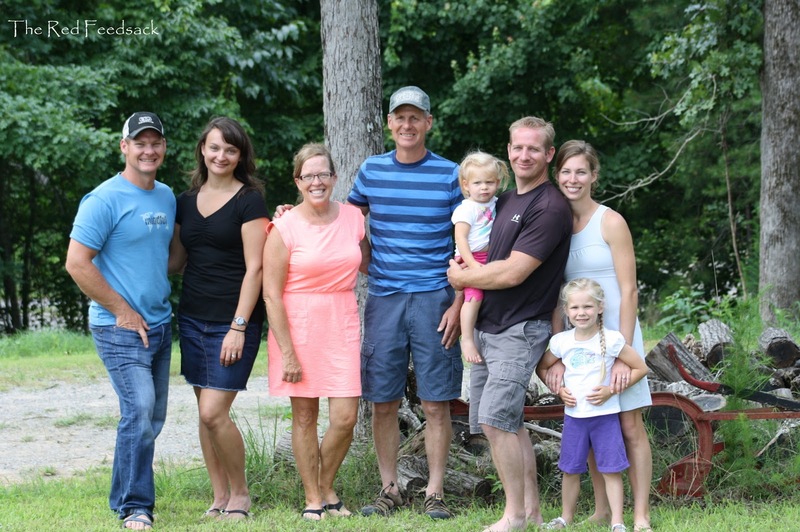 And the last thing to happen last week was that we had a weekend of fun with all of us together. Our son and his wife are on the left, Eldon and I in the middle, and then our daughter and her husband and gorgeous girls on the right. It was one of those weekends where we didn't realize how badly we needed to get away from the work on the house until we actually got off the hilltop and dipped our feet in the water! No, it wasn't the ocean but it was a close second! Call me slow, but I just got that your daughter is Andrea from Keeping It Cozy - another blog I follow and love!!!! How wonderful (I am right, right?!) Loved this post and truly envy you all the open fields - I love my woods, but there are days I would easily trade for an open vista. Love reading what's going on in your busy and creative life. Wonderful stuff for sure. beeeee yooooo ti ful! All of it! 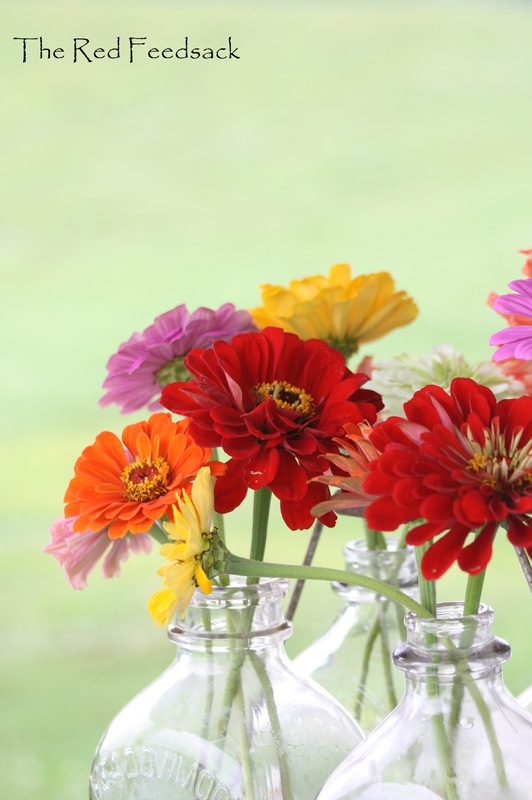 Garden, zinnias, farm, faucet, jam, and family! AND YOU! Love you, and thanks for letting us peek! I know Dori...just where does the time go anymore? Also...who thought of that "lazy days of summer" saying? However, I find sometimes I just have to stop, and make it be about being lazy...like you said...stop and dip your feet into the water. Glad you had that time with your beautiful family! What a lovely family photo! Beautiful. Wonderful family picture! 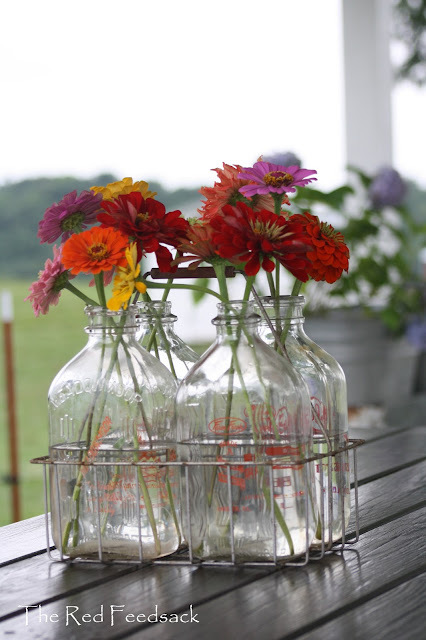 Love the zinnias in the milk bottles too. I can't wait to see your plaid wall - I saved that picture from Southern Living and went to their website to see how you do it!!! You have inspired me to get going on that project! Looking forward to seeing it - it will be beautiful! The Gingham Wall - Should It Stay? The Perfect County Fair Skirt!